Leicestershire have been deducted 16 County Championship points for repeated disciplinary offences. Bowler Charlie Shreck was found guilty of "using language that is obscene, offensive or insulting and/or making an obscene gesture" in a pre-season match against Loughborough MCCU in March. The county's fifth offence in 12 months triggered the automatic punishment. Captain Mark Cosgrove, in charge for each of the indiscretions, has been banned for one Championship match. The punishment means that Leicestershire, who finished seventh in Division Two in 2016, will begin the season on minus 16 points. Their campaign begins on Friday at home to Nottinghamshire. The club have also been fined £5,000 and given a further eight-point penalty suspended for 12 months. 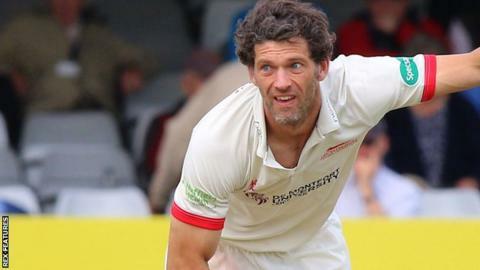 Fast bowler Shreck, 39, has been given a two-match suspension by the county. Cosgrove pleaded guilty to the charges and is set to serve his suspension in a fortnight's time, in the Championship match against Glamorgan which starts on 21 April. "We've got to get better and be more disciplined - 16 points is a big deal to us. It's a game," Cosgrove told BBC Radio Leicester. "Hopefully we can get some positive points on the board. This hurts the boys. We need to learn and get better. "Charlie is very disappointed and very apologetic. He overstepped the mark. He knows he did the wrong thing. "We've just got to take it and move on and get busy into the season." In August 2015, Leicestershire were deducted 16 points and given a suspended fine for similar breaches. In a statement from the cricket discipline commission on Friday, it was "noted that actions taken by the club since the previous disciplinary panel hearing have not been effective". Durham begin their Division Two campaign on minus 48 points, the England and Wales Cricket Board having imposed the penalty because of the county's financial problems. Meanwhile, Leicestershire opener Harry Dearden has signed a one-year contract extension, Aadil Ali has agreed a new deal until 2019 and academy batsman Sam Evans has signed a three-year deal - his first professional contract.